Home Health & Wellness Tooth Talk Is Chewing Gum Bad for Your Teeth? Chewing gum has been around since the ancient times when it was made from tree saps. 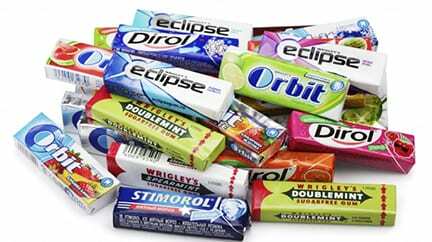 Today, the base used for most gum products is a blend of synthetic materials. The average American chews about 1 pound of gum each year. With so much gum going into our mouths it is important to know how chewing gum affects our dental health. You may have heard that gum is both good and bad for your teeth, so let’s find out the real deal. Gum sweetened with sugar is bad news for your teeth. When you choose a sugary chewing gum, you’re not only satisfying your sweet tooth but the bacteria in our mouths like sugar too. The bacteria continue to enjoy the sugar remnants found in your saliva long after you have spit the gum out. The sugar is used as a fuel by bacteria to produce acids that weaken tooth enamel and cause cavities. Why is Chewing Sugarless Gum Better? The physical act of chewing gum tends to increase salivary flow in the mouth. If you chew a sugarless gum after eating this can help neutralize and wash away the food debris and bacteria from your teeth. Increased saliva flow also helps facilitate a carrier for more calcium and phosphate which help to strengthen tooth enamel. Chewing sugar-free gum can only act as a supplement to your daily oral hygiene routine and can’t replace daily brushing and flossing, it is not a substitute for either. Chewing gum is fun and is delicious tasting, but remember the type of gum you choose can make a big difference. Make sure you chew a sugar-free gum and your smile will thank you!